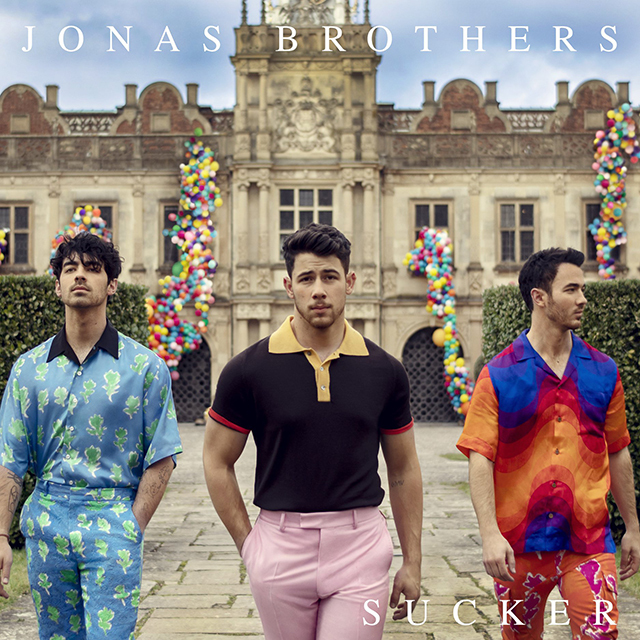 Jonas Brothers are back together and their first new song in 6 years, Sucker, is available to stream and download now. In the stylish clip Nick, Joe and Kevin are seen performing and partying with their respective other halves. Nick’s wife Priyanka Chopra Jones (Quantico), Joe’s fiancée Sophie Turner (Game of Thrones) and Kevin’s wife Danielle Deleasa are all looking very glam in the gorgeous visual. The video, directed by Anthony Mandler, takes place in the huge Hatfield House mansion in the UK, which has very expansive gardens. There’s also scenes of the Jonas Brothers singing in a bath tub outside! Sucker is produced by Ryan Tedder and co-produced by Frank Dukes. It’s expected that the trio will be releasing a new album later this year and from the sound of Sucker, it’s going to be a real pop treat.